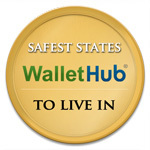 June is National Safety Month so WalletHub conducted an in-depth analysis on 2015’s Safest States to Live In to help people who are thinking of relocating. To help prospective movers find a safe location in which to lay down roots, WalletHub analyzed the 50 U.S. states and the District of Columbia across 20 key metrics. Some of the metrics in our data set include the number of assaults per 100,000 residents, the number of fatal occupational injuries per 100,000 employees and the percentage of the population lacking health insurance coverage. For the full report, please visit here.